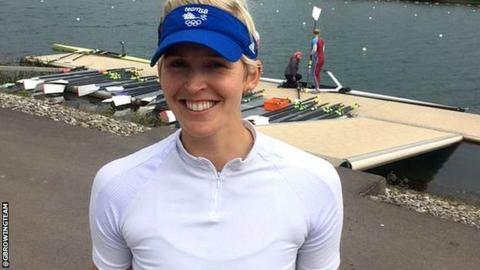 Olympic champion Katherine Grainger finished second in her first Great Britain senior trials since 2012 as Vicky Thornley took victory. Thornley, 27, made a fast start to the women's single scull final and had a decisive full-length lead by halfway. Grainger took two years out from rowing after winning double sculls gold with Anna Watkins at London 2012, completing a PhD in homicide during her time away. "I've only been back a relatively short time," said the 39-year-old Scot. "It would have been lovely to take the title again but it was a feisty second place and to someone like Vicky who is an amazing sculler. "She had a great season last year and has clearly learned a lot from that." All those in action at Caversham were competing for places in May's European Championships squad, with the line-up for Poland to be announced on 13 May. Alex Gregory and Mohamed Sbihi came out on top for the second year running in the men's pair final, winning by a length from Constantine Louloudis and Pete Reed, with George Nash and Will Satch in third. "There was lots of pressure on us as the lead pair and we've been feeling it for the last three weeks," said Gregory. "That was really important." Imogen Walsh and Charlotte Taylor finished in front of Olympic lightweight women's double champion Kat Copeland in the single scull final, while Olympic champions Helen Glover and Heather Stanning cruised to victory in the women's pair final. "The Europeans kick off the season," said Stanning. "In terms of targets, it is difficult to compare times this weekend to regattas elsewhere. "We have developed as a pair. Individually we have become better athletes over the years and we have grown together as a combination."